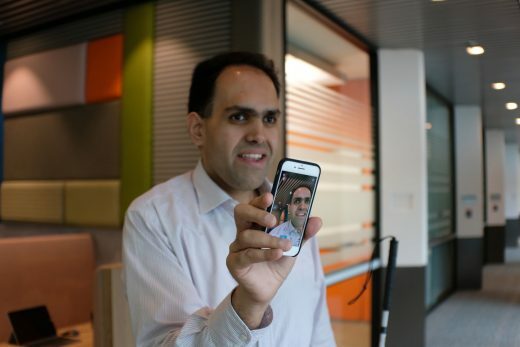 Microsoft’s computer vision app for the blind and poor-sighted, Seeing AI, just became more useful for those moments when you’re less interested in navigating the world than learning about what’s on your phone. The company has updated the iOS app with an option to explore photos by touching them. Tap your finger on an image and you’ll hear a description of both the objects in that scene as well as their spatial relationship. You can get descriptions for photos taken through Seeing AI’s Scene channel, but they’ll also be available for pictures in your camera roll as well as other apps (through options menus). The upgrade also brings native iPad support. That’s not for screen size, of course, but rather where you can use a given device. Many workers can’t use a smartphone in certain environments, for example — this opens the door to Seeing AI in those spaces. On top of this, Microsoft is making subtler improvements, such as customization for the channel order and faster access to face recognition. You should have an easier time getting around whether or not you have pictures on hand.